Pumpkin Vines LLC Imports directly from multiple manufacturers. The premium ElfDiaper line includes all in one, pockets and covers. The ElfDiaper pocket diapers are available with velcro and with plastic snap closures. Our two additional manufacturers focus on providing SGS tested cloth diapers for families interesed in trying cloth at an affodable price. The Diaperaddict.com store cells Cut & Sew patterns; newborn diaper covers and menstrual pads are provided through Famicheer; Anan Baby pocket diapers in both adjustable "One-Size" diapers and in newborn sizes; a wide range of ElfDiaper including AIO, pocket diapers, diaper covers. Diaper Addict is proud of the relationship we have with our overseas manufacturers and their commitments to international testing standards. Diaper Addict.com is interested in helping families consider cloth. Diaper Addict hosts Diaper Debut Classes to help families understand what modern cloth diapering is all about. 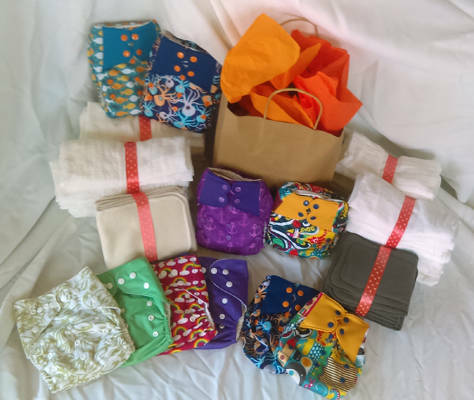 Pumpkin Vines LLC Imports a range of cloth diapers so that families have a ranges of options at reasonable pricespoints. We are available to work with local families to help them budget for the switch to cloth. Check out our Diaper Debute Classes and get your stash at a discount!